Two years ago, Lindsay and Kerry Clare abandoned their small office on the Sunshine Coast to enter the turmoil of Sydney’s development politics, as contract design directors for the NSW Government Architect. Now, as they move back to private practice (remaining in Sydney), Queensland Government Architect Michael Keniger reviews their public schemes and the unusual experiment. The appointment of Lindsay and Kerry Clare as Design Directors of the New South Wales Government Architect’s Office two years ago entailed risk and uncertainty for the Clares and for the Government Architect, Chris Johnson. Against this, the Clares stood to gain experience of a wide range of public and urban projects whilst the Government Architect’s office would potentially benefit from the catalytic effect on its internal culture of two such highly skilled and committed designers. As the Clares come to the end of their appointment, has the initiative paid off? What has been achieved and is the interaction between private practice and public offices through such appointments to be more widely encouraged? The model, looking towards the south east. On their part, the Clares have engaged with projects of a scale and complexity that they were unlikely to meet in their home base at Buderim on Queensland’s Sunshine Coast. Their architecture had received international recognition yet was largely comprised of private houses. To move from the familiarity of their home patch to the cut and thrust of Sydney was of less concern than whether their design experience would meet the needs of complex, urban schemes. These qualms dissipated with a series of well-framed designs for projects as diverse as the Olympics School at Homebush and the redesign of the ferry terminals at Circular Quay. There has been controversy, as with the proposed alterations to the Overseas Passenger Terminal at Sydney Cove, originally designed by Lawrence Nield and Peter Tonkin. Yet, generally, the contribution of the Clares to the Government Architect’s Office has been welcomed. 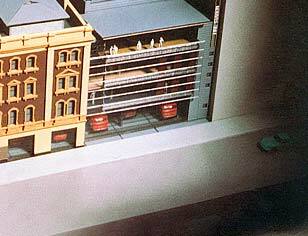 Model of new headquarters for the Sydney Water Police at Balmain. The following short reviews of four selected projects offer snapshots of works that have yet to be completed. Their breadth indicates the variety of needs to be met in the public realm and the versatility of the architects. As the Clares return to private practice, it is hoped that they will have a continuing role in the implementation of these schemes and that the built works will stand as testimonies to the contribution they have made to the Government Architect’s office. The lodge was built in 1859 as a diminutive but finely scaled two-storey tower marking a gateway into the Botanic Gardens. After being altered and extended to serve as staff accommodation, it fell into disuse despite its historical significance. Additional space was required to make it viable as a restaurant/café and the Clares were invited to review the possibilities. Their scheme includes a glazed pavilion to sit lower than the existing lodge, sheltered by the surrounding trees. The pavilion and adjacent terrace will enjoy views across Farm Cove to the Opera House framed by the Harbour Bridge beyond. On two levels, the five metre by seven metre structure is tucked into the slope of the land to minimise its scale. The internal space is given order and definition by the timber columns that support the skylight above, with a further intricacy given by dropping the ceiling in the four corner bays. A move towards minimalism is evident with the frameless glass cladding to be shaded by thin, cantilevered steel awnings. The project has yet to receive Heritage Council approval. North-east elevation of the Victoria Lodge scheme. In many ways this project is closer to the Clares’ earlier work; comprising a series of refined, single-storey, naturally ventilated, shed-like pavilions framing a linear court. The centre focuses on sustainable agriculture and the facilities were required to employ passive heating and cooling techniques to combat the fierce, dry heat of summer and the cold and mists of winter. The design was developed with advice from the NSW Department of Energy and Environmental Services. The east-west axis maximises exposure to the north and limits the effect of the western sun. The courtyard, with its reflective pools and misting system, will provide oasis-like relief from the surrounding, open landscape. On the northern face of each building, rammed earth walls, with high thermal mass, will act as heat sinks. Other external walls are planned in reverse masonry veneer with plywood cladding over a masonry core. Skylights along the centre of the key spaces will admit south light and assist with cross ventilation. Solar powered fans will draw air through ground effect ducting some two metres below ground level to smooth thermal extremes. These systems will combine to enable the spaces to be open and flexible rather than air-conditioned and sealed. The design of the buildings and spaces is distinguished by the clarity of planning and strong ordering of space and material. The project is under construction and nearing completion. Model of the Sydney airport pedestrian bridge.Spanning about 20 metres across a two-storey void at Pier 3 of the new international terminal, this bridge is both interrogative and proclamatory. It is one of seven major artworks provided by the art built-in budget for the terminal designed by Woodhead International. The bridge is intended to provoke speculation about reconciliation with the Aboriginal people and their culture and was designed in collaboration with Merrima, the Aboriginal design unit of the Government Architect’s office. The offset deck, formed of bands of jarrah, stainless steel and glass, will cantilever from a 1.5 metre-deep steel spine beam. These materials will be graded across the deck from the solidity of the supporting beam to the fragility of the open grating that skirts the opposing glazed balustrade – to heighten the tension between the glancing curve and transparency of this edge and the unyielding straightness and solidity of the other. The deck is being inscribed with texts evoking aspects of reconciliation; two of which are repeated across the bridge: “The past is all about us and within” from ‘The Past’ by Oodgeroo Noonuccal and “the spirit’s in the land” from ‘Native Born’ by Archie Roach. The bridge provides a place to stop and reflect both on the past and the future; contradicting its role as a thoroughfare through the space of a bustling airport. Although yet to be completed, the form, material and detail of the bridge suggest that it will fully answer its brief. Number 1 Fire Station, Castlereagh Street. The No. 1 Fire Station called for the extension and adaptive reuse of existing buildings on a tightly constrained urban site. The initial sketch schemes were for a residential tower before the brief settled onto the refurbishment of the existing fire brigade buildings and the addition of new training, residential and recreational amenities. Substantial heritage concerns had to be addressed as the existing buildings date from 1878 and are significant in having housed the oldest serving fire brigade in the Southern Hemisphere. The adjacent, former boot factory is to be demolished to make way for the additional accommodation. West-east section of the No. 1 Fire Station. The new structures include a protective parasol roof to the external training yard and a monitor- roofed block straddling the engine bays and driveway. This incorporates a games court, overnight accommodation for the fire crews, a mess hall and kitchen. The elevation of this wing is an exercise in urban modesty with its full height masked to match the scale of the adjacent buildings. The layered facade provides a deep edge zone that allows relatively clean air to be drawn from above whilst providing acoustic insulation to the spaces within. The new block and training yard are roofed with raking planes of lightweight steel and benefit from the Clares’ control of material and detail. This project has received approval and is proceeding to contract documentation. North elevation of an abandoned scheme involving an apartment tower. East section of the National Environment Centre, Thurgoona College of TAFE. Model of the Environment Centre. 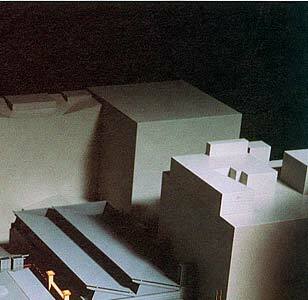 Model of Lawrence Nield & Partners’ Sydney Cove Passenger Terminal, showing proposed but not approved revisions by Clare Design/DPWS with Bligh Voller Nield. 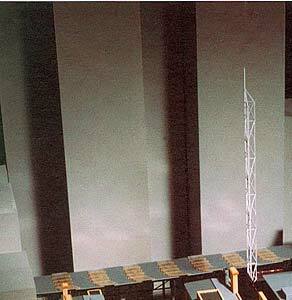 Model of the Olympic Village School, being built at Newington. Greenhouse Neutral Conference Centre in the Cumberland State Forest. 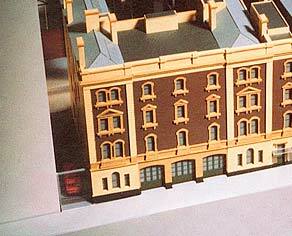 Model of fire station revisions, fronting Castlereagh Street. This entry was posted in Uncategorized on April 5, 2013 by admin.